Redback Garrison » Blog Archive » The Redback Garrison Launch! December 9, 2009Posted by Moxxxie Comments Off on The Redback Garrison Launch! The Redback Squad was officially formed in 2007. Since then, numbers have grown from the 10 original founding members, to well over 30 active troopers throughout Queensland. 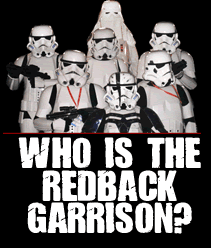 The new Redback Garrison, part of the worldwide 501st Legion volunteer costuming and fundraising organization, have distinguished themselves at many local events, such as the Bridge to Brisbane, MS Moonwalk and pop culture events like Gencon and Supanova. The Redbacks pride themselves on having high-quality movie accurate costumes that look like they’ve walked straight off the movie set and right into the streets of Brisbane! The Redback Garrison members are all volunteers who give up their time and dress up in Star Wars costumes in order to raise donations and draw attention to a variety of childrens charities. Most importantly, they enjoy bringing smiles to those who most need it. This entry was posted on Wednesday, December 9th, 2009 at 11:50 am	and is filed under Garrison News. You can follow any responses to this entry through the RSS 2.0 feed. Both comments and pings are currently closed.